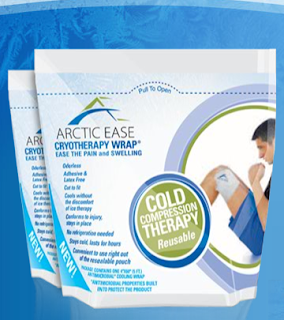 Arctic Ease wraps and pads are a convenient way to use cold therapy to treat aches, pains, bumps and bruises. Using cryotherapy technology, Arctic Ease wraps stay cold for hours without refrigeration while wrapping around anywhere they are needed, conforming to any injury. They are reusable and compact so they make a great addition to any athlete or parent's medicine cabinet. They are eco-friendly and non-toxic, plus they don't give you "freezerburn" like bulky ice packs can. This Thursday, January 13th at 7 PM CST (8PM EST/ 5 PM PST), Carla Birnberg (@MizFitOnline), Ana Picazo (@Bonggamom), Lisa Johnson and Joyce Cherrier will be leading an @ArcticEase #CoolWraps Twitter Chat, talking about fitness, eating healthy and generally restarting your wellness momentum for 2011. RSVP at MizFitOnline's blog and join in using the #CoolWraps hashtag on Twitter to be eligible for great prizes, including Amazon gift cards and Arctic Ease sample packs and tees. The Grand Prize, a $150 Amazon card + Arctic Ease pack/shirt, will be given out at the end of the party. Click here for a $2-off Arctic Ease coupon. Disclosure: In accordance to the FTC Guidelines and WOMMA Code of Ethics, I am disclosing that I received samples of Arctic Ease to review and was asked to write about through my membership in Mom Impact. Very nice! I like the idea of those!